Chefs need fresh ingredients to be instantly accessible. But put a pan of fresh ingredients in the middle of a hot, busy kitchen and they’ll soon start to suffer. However, put them in a pan in a Williams Onyx prep counter and they’ll still be instantly accessible, but they’ll also be stored safely, at the right temperature, so they stay fresh for hours. Which is why the Onyx is so popular, and why Williams will put it centre stage at Equip Hotel 2018. 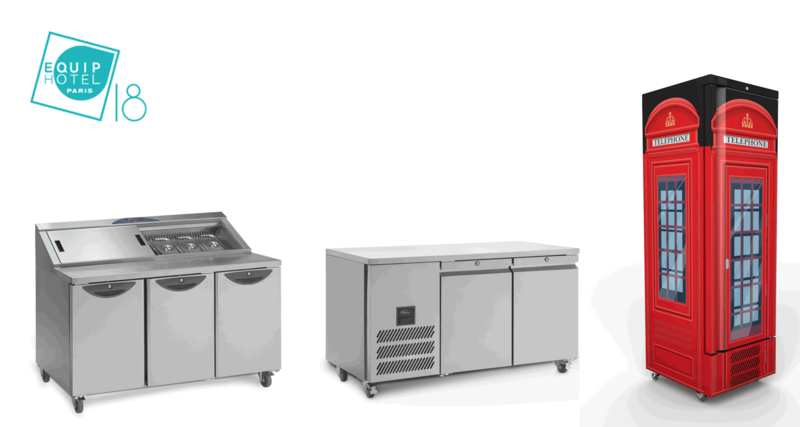 The Onyx CPC3 features a three-door counter, with 320 litres of storage, topped with work surface and up to seven 1/3GN gastronorm ingredients pans. These are held in a sloping design to make it as easy as possible to access the contents. A curtain of air directed over the tops of the ingredients, plus a clever airflow design inside the cabinets, ensures consistent temperature throughout all of the pans. The Onyx will be shown alongside Williams’ popular Jade JC2 two-door counter. Also on stand F105 visitors can see a British icon: the classic red phone box. However, this is no ordinary phone box – it’s actually a Jade J300 upright fridge that’s been customised with William’s Chameleon service. Chameleon uses a hard-wearing, food safe vinyl wrap to turn fridges and freezers into eye-catching front of house design statements. The J300 beneath the Chameleon wrapping is one of Williams’ latest product launches: an ‘ultra slim’ upright cabinet with a footprint of just 595mm by 684mm and a 335litre capacity, it delivers a practical storage solution for kitchens short of space. Other innovative products on show include the PW4, a mobile prep well that is developed for kitchens with limited space, and a Multideck merchandiser (HJ600), which is designed to maximise grab and go sales. Williams personnel will be on hand throughout Equip Hotel at Stand F105, to provide expert advice on all aspects of foodservice refrigeration.